Eelco Schattorie fielded the same team that drew recently in Jamshedpur with Ogbeche leading the line and Gallego providing creativity in midfield. For Bengaluru, Albert Serran was fit and he came in for Chencho Gyeltshen in BFC's only change from their 2-1 win over Pune City last week. The #NEUBEN line-ups are out and @ESchattorie has named an unchanged XI for @NEUtdFC while @CarlesCuadrat replaces @Che7cho with Albert Serran! Northeast almost took the lead courtesy of an incredible mishap by Gurpreet Singh Sandhu in the first minute of the game. The ball was passed back to the goalkeeper from Bengaluru's kickoff and his came up with an atrocious clearance which was heading towards a Northeast player but Erik Paartalu saved his team. Bengaluru tried to calm themselves down after that incident and normality was restored in their game. Both teams tried to attack to the best of their capabilities but their respective defences were totally up to the mark and dealt with any kind of danger posed by either sides. This high-octane action went on for the whole first half. Bengaluru reshuffled their formation in the second half. Khabra moved to right back and Bheke took the left back spot. Nishu Kumar was deployed in the left wing as the visitors played a 4-4-1-1 formation with Xisco just behind Chhetri. The result of that tactical change started to show results as Bengaluru started playing more freely. Erik Paartalu and Sunil Chhetri had back-to-back attempts between the 56th and 59th minute as Ogbeche and Grgic came up with brilliant defending to keep their side from conceding a goal. Northeast were rewarded with the lead soon after, when Federico Gallego gave them the lead in the 64th minute of the game. Bartholomew Ogbeche lobbed a ball to a completely unmarked Federico Gallego in the box. He wrong footed Albert Serran before shooting at goal. Gurpreet Singh Sandhu got a hand to the shot but the ball bounced into the goal to send Guwahati into a frenzy. A brilliant recovery and a quick pass from Ogbeche to pick out Gallego to takes his time and slots it past Gurpreet! Northeast actually started believing they could be the ones to hand Bengaluru their first defeat in this season's Indian Super League. Shell-shocked, the Blues brought in Chencho for Serran in the 71st minute. Bengaluru had another attempt at Northeast's goal courtesy of Khabra in the 75th minute, which was heroically blocked by Mato Grgic who dived to block tthe attempt. ​The Highlanders made a double change with under 15 minutes before the final whistle. Lakra made way for Reagan and Gurwinder came in for Redeem Tlang. They held on for all of the 90 minutes in this game but Bengaluru FC as we know, have scored the most number of late goals in the ISL this season and they did so again, astonishingly in the 92nd minute courtesy of Chencho, who ended up silencing the Jawaharlal Nehru Stadium in Guwahati with a bicycle kick. 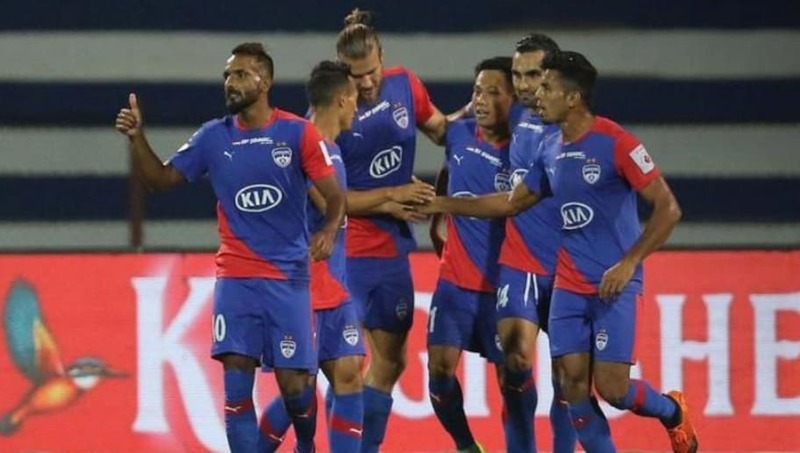 Lewis whipped the ball into the box and Chhetri headed it to Chencho, who bicycled it home as Bengaluru snatched a point out of the jaws of defeat. With this draw, Bengaluru stayed the only undefeated team in the ISL this season and moved to 23 points from nine games at the top of the table. The Highlanders, meanwhile stay second on 19 points from 10 games. FC Goa and Mumbai City are third and fourth respectively, on 17 points and a win for both these teams could see Northeast drop to fourth spot in the standings.